I really hope that The Hills is fake-- otherwise, Spencer needs to be kicked in the balls (hard). And yes, I'm the only 28 year old in America that still watches The Hills. I'm 36 and I watch it! Drama is drama at any age! And yes, Spencer is a major tool. I still watch the Hills, you just can't help it. I couldn't believe the last episode I watched where Heidi said she was disappointed she could get H's to match her name! haha So crazy! I'm almost 30 and I still watch it...it's so ridiculous that I can't stop watching. Spencer & Heidi are crazy people! It is just fun sometime to watch craziness!! Oh girl, I'm 28 too and I tune in faithfully every week with my 19 year old sister to take in every bit of drama! I really hope it's fake too and what the heck is up with these darn crystals. I read in US Weekly that they have spent over $400K on crystals!!!! I still watch it too. Gotta get my drama from somewhere... Spencer is CRAZY, like big time. My sis thinks that he's abusing Heidi... Maybe throwing bad crystal mojo at her. I really felt for Stephanie and Holly yesterday (I'll admit that I even teared up a little), such a hard thing they have to deal with and the decision they had to make towards family. I watch and am 28 as well! 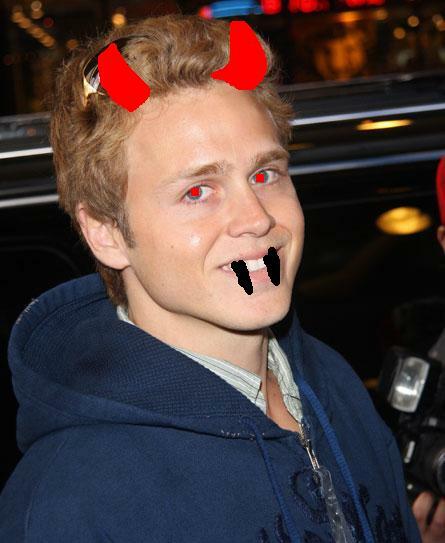 Spencer really scares me -- what is wrong with him!?!?!?!? I hope so too. How big of a jerk is he?! I'm watching and I agree - he is crazy loony tunes. I lean towards it being fake though. No one can be that loco.